Chewy caramel goodness paired with a South African favourite! 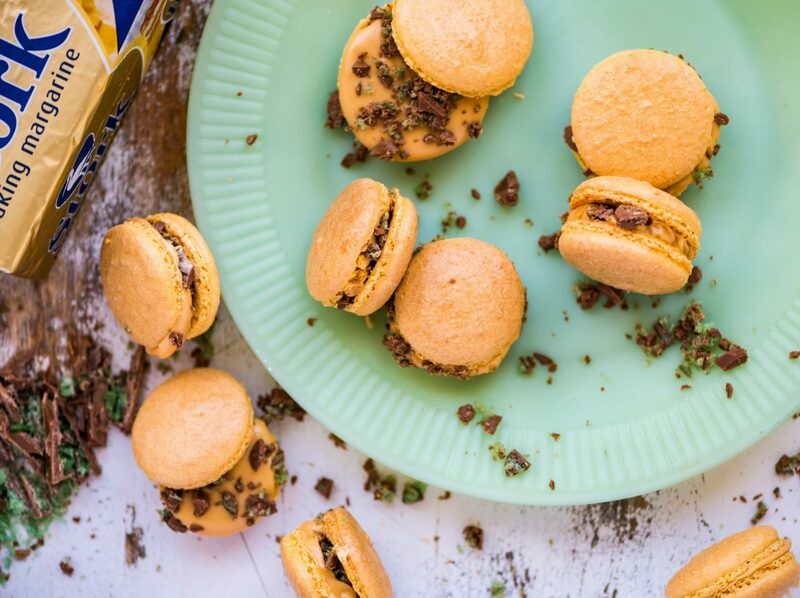 Caramel Peppermint Crisp Macarons will take you straight to dessert heaven. Line 2 x baking trays with baking paper or a silicone baking mat. Place the desiccated coconut, icing sugar and salt in a food processor and pulse until fine. Sift the mixture twice and pulse any remaining lumps until they pass through the sieve. Place the egg whites in the bowl of an electric mixer with the cream of tartar. Heat the sugar and water in a saucepan over medium heat and bring to the boil. Simmer until the syrup reaches 113 degrees celsius. Start whisking the egg whites until they reach soft peak stage then pour the hot syrup down the side of the bowl into the egg whites in a steady stream. Continue whisking until the meringue is thick, glossy and still warm to the touch. Fold the coconut icing sugar mix into the meringue in two parts, using a metal spoon, taking care not to knock the air out. Keep folding until the batter is glossy and forms a thick ribbon when dropped off the spoon (to test, drop a blob on the baking tray and tap 3 times - it should spread nicely) . Place in a piping bag and pipe 5 cm rounds, leaving enough room for spreading. Tap the baking tray firmly on the work surface 3 times to remove the bubbles and for the macarons to spread slightly. Allow to sit at room temperature for 45-55 minutes or until the surface of the macaron no longer feels tacky to the touch (it shouldn’t stick to your finger). Preheat the oven to 95 degrees celsius fan-forced (105 degrees conventional). When the oven is ready, place one tray of macarons in the middle of the oven and bake for 15 minutes then immediately increase the temperature to 175 degrees fan-forced (185 degrees conventional) and bake for 9 minutes. They are ready when the feet feel firm and the shells just come off the baking paper if you lift them. Allow to cool completely. To make the caramel cream, whip the Stork bake and icing sugar until light and fluffy then whip in the tinned caramel. Place in a piping bag fitted with a plain nozzle. Pipe the caramel cream on one macaron then sprinkle with the peppermint crisp and sandwich together. Tip: Make your own coconut flour by placing desiccated coconut in a food processor and grinding until fine. Macarons are best eaten the day after assembling as they become chewy.